In 2 years, Erica lost more than 70lbs and 5 pant sizes. She lost more than 60lbs before training with Jessica, and with Jessica’s help she got the last 10lbs off and went from 18.6% body fat to an incredible 13.8% body fat! Over the past few years, I have made quite a change in my daily lifestyle. Smoking 2 ½ packs of cigarettes a day was a part of my life for three years. Food was my worst enemy; I had no self control. My clothes kept getting tighter and shopping was no longer fun for me. All I wanted to do was take a nap after every meal and I had no energy. Enough was enough and it was time I made a drastic change. By April 2009, I was 185 pounds and was the heaviest I had ever been. First, I decided to quit smoking and did so cold turkey. The second goal I set for myself and accomplished was eating right. The Barnes and Noble health section was my new best friend. I took it upon myself to read books about nutrition and how to cook healthy. Once I changed my entire eating habits, my weight went down to 175 after 4 months. From quitting smoking to eating right, the last and final step was exercising. I joined Anytime Fitness in Milwaukee in October 2009. I decided to hire a Personal Trainer and this was just the extra push that I needed. A combination of cardio and weight training was incorporated into each workout and little by little I started losing more weight. Once I switched to Anytime Fitness in Cedarburg I was 135 pounds. I was still weight training and pushing the cardio 4-5 times a week. At this point, I primarily wanted to strengthen my core, tone up and learn how to incorporate different types of workouts into my weekly routine. I felt I also needed that extra shove and I wanted to be pushed beyond what I thought I was capable of. This is where Jessica comes in…After the first session with Jessica, I knew our training sessions would be exactly what I was looking for, a challenge! With Jessica there has not been one workout session or exercise that have been the same. For instance, she has taught me how to squat on a Bosu ball with weights and perform bent over rows with one leg out. I am doing exercises I never thought I would be able to do. I have fun putting myself to the test with Jessica and now see that I have it in me to go above and beyond what I was doing before. When learning an exercise, I realized that proper body mechanics is extremely important. Jessica takes the time to point minuet details out during an exercise, but without her doing so, I wouldn’t be where I am today. Prior to Jessica, my back felt agitated on and off. Since training with her, my back has never been stronger nor does it feel agitated. I have become so much stronger and I can now do 8 “boy” pushups in a row. I have built much more muscle and gotten rid of more fat. Before training with Jessica, I got all the way down to 125 pounds. Once we started training together I started out at 125 pounds,18.6% body fat and I was in a size 6. 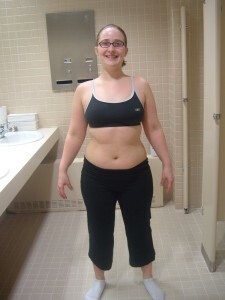 Six weeks later, I was in a size 3/4, 115 pounds and at 13.8% body fat. Jessica has been a true partner in my success. 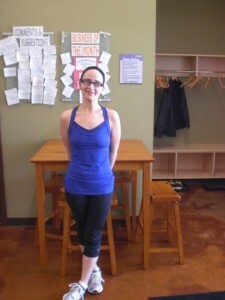 She is very passionate about fitness and is extremely knowledgeable and personable. Thanks Jessica for helping me make this huge transformation! I just cannot believe that two years ago I was 185 pounds and a size 14. Health and fitness is and will always be a part of my life! Previous Post:Success Story- Chrissy B. Next Post:Success Story- Joe B.